Rotary Club of Wigton - welcome! Please scroll/swipe down through this page to find out more about us, in addition to the pages linked in the menu, top-left. We have again supported Wigton Christmas lights. Dewode - this West Cumbrian charity works with women in Uganda and has been supported by our Club over a number of years. 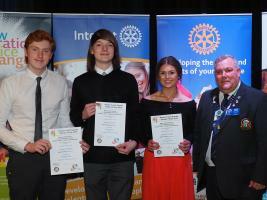 Wigton Club supports a range of projects involving local schools from junior to sixth form stages. The club has always placed great emphasis on it's Youth Activities programme, these include Young Chef, Young Writer, Youth Speaks, Young Photographer. Wigton is a small market town with a population of about 5,000, lying on the edge of the Solway plain midway between Carlisle and Cockermouth and Penrith and the west Cumbrian coast. Wigton is the home of Innovia, a company which manufactures Britain’s first plastic bank notes and of Futamura, the UK’s only manufacturer of Cellophane film used widely in the food packaging industry. Products from these two companies are exported to over 150 countries worldwide. We are looking to establish a new club that will meet whenever and wherever thet choose, in perhaps a less formal way - it's up to them. We will be encouraging people of all ages, male and female to come along and see what it's all about. There's no pressure - just come along and see for yourself. If you are interested and would like to know more about what we get up to then please contact Don Cooper on 016973 44971 or any other member of the Wigton club. Tonight we will be joining with Maryport and Silloth Clubs meeting at Silloth Golf Club. The guest speaker will be Rachel Holliday, founder of Time To Change and of Calderwood House Egremont.